What are the common pitfalls you face when starting your fiber rollout? We have listed eight potential problems below that are not obvious when starting up a fiber business. A decision to wait with automation: As volume increases, manual work will lead to customer dissatisfaction, human errors, a great deal of time spent on routine tasks and unnecessary staff expansion. This results in delayed rollout, changes of plan, stressed software design decisions, and a focus shift from network rollout to the management of resources and IT. Only automate for the initial deployment: The design fails to address occasional tasks that become daily tasks with volume. Unidentified costs and other surprises come later with volume. Automation for the current access technology and vendor. What will be the effect of introducing a new vendor and access technology (SDN/NFV, GPON or Active Ethernet)? Cost increases and surprises in the long run because of vendor lock-in or non-flexibility in design. Non-existing thinking about automated feasibility and availability processes: It is not possible to differentiate the offering on area or by campaigns and there is no possibility to inform about network build-out plans or products going end-of-life. This leads to lost momentum compared with competitors with the risk of having a lower market share and a great deal of time being spent on communication with customers about network rollout plans. If you run a wholesale business you might initially have only one or two service provider(s): Adding more can get you into trouble if you lack automation support, data separation and self-service. This might lead to heavy investment in the systems to manage this, for example the development of API or self-service portal. Not investing long-term: The largest part of system TCO is not really the initial investment, but rather system cost and maintenance cost in the long term. What happens if the business plan changes along the way? What happens if key resources quit? How do you make sure IT security aspects are covered? How do you handle legal changes and requirements? Do you have internal resources that stay up-to-date with the latest technology and best practice of automation? All this can lead to heavy costs and re-planning. Trying to build the fiber business using highly generic IT solutions: For example, using ITIL ticketing tools (designed for datacenters and IT organizations), CRM systems, ERP systems and integrating them with an Enterprise Service Bus. This will lead to enormous integration costs and complexity in the long term due to lack of fiber business domain functionality and endless integration work. Only automate the residential services: This can lead to identified costs when the network grows, and you get a substantial proportion of business customers or IoT services that will need appropriate automation support and even self-service in order to remain competitive and to increase margins. When everything is working with an IT system used in operations nobody takes any notice of its existence, but when you have problems everyone knows about its shortcomings. A purpose-built system that has been in operation for many years might be the key component to a successful business and a fast rollout. The fiber journey can be easy if you think ahead and have the right knowledge. 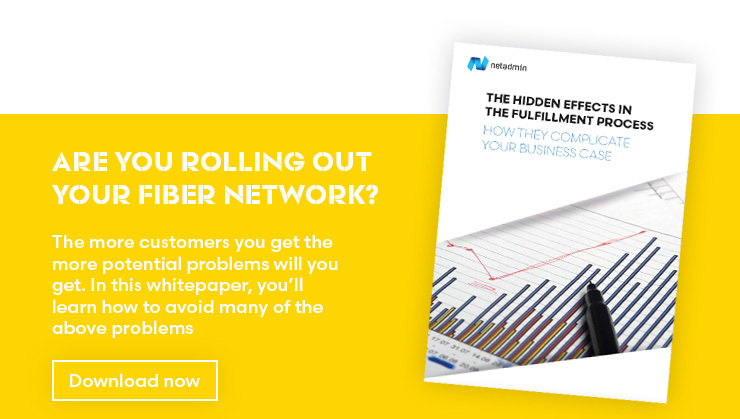 Read our whitepaper on this topic to find out more of what you can do to avoid and contain these potential problems.